“Los programas INREF, KNAW-SPIN y PromoBanana involucran la colaboración de varios científicos que apuntan a resolver el problema de la enfermedad del Marchitez por Fusarium. La actual amenaza que ejerce la raza tropical 4 (TR4) requiere una rápida divulgación de los resultados obtenidos. the Fusarium oxysporum f.sp cubense-banana interaction? García-Bastidas, F., Ordóñez, N., Konkol, J., Al-Qasim, M., Naser, Z., Abdelwali, M., Salem, N., Waalwijk, C., Ploetz, R.C., and Kema, G.H.J. Pathogens: Appeal for funds to fight banana blight. Kema, G. H. J., Weise, S.
The end of the banana. 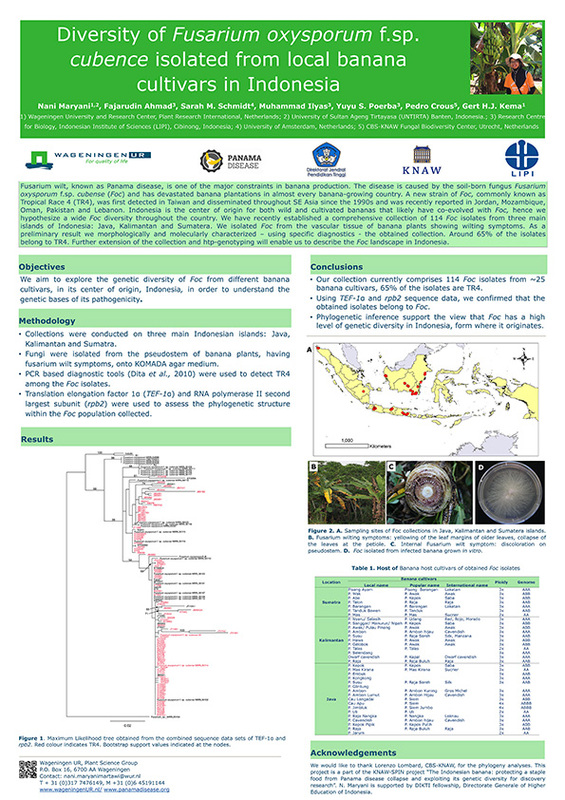 First report of Fusarium oxysporum f. sp. cubense tropical race 4 causing Panama disease in Cavendish bananas in Pakistan and Lebanon. Ordóñez, N., García, F.A., Laghari, H., Akkary, M., Harfouche, E.M., Al Awar, B.N., Kema, G.H.J. 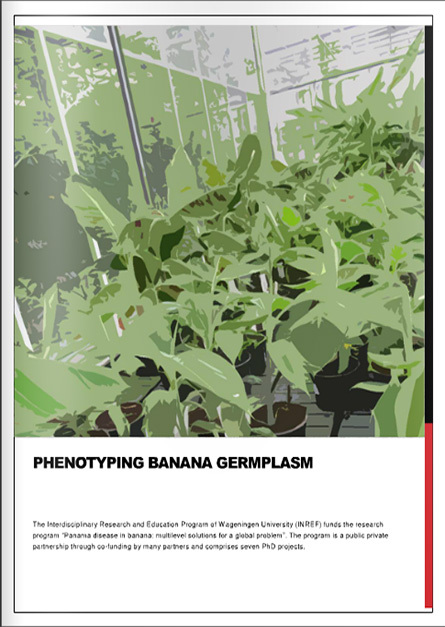 Worse comes to worst: Bananas and Panama disease – when plant and pathogen clones meet. PLoS Pathogens, DOI: 10.1371/journal.ppat.1005197. Ordonez Román, N.I., Seidl, M.F., Waalwijk, C., Drenth, A., Kilian, A., Thomma, B.P.H.J., Ploetz, R.C., and Kema, G.H.J. 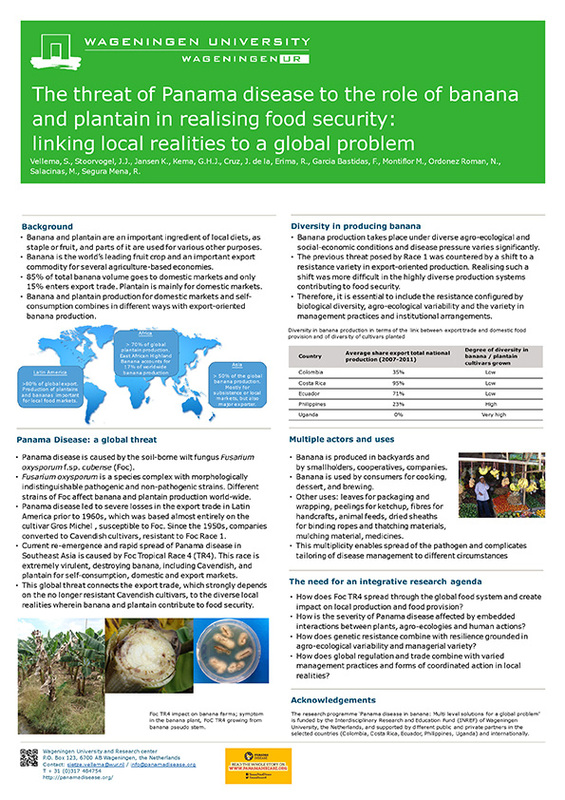 Impact of diseases on export and smallholder production of banana. Annu. Rev. Phytopathol. 53:269-288. Ploetz, R.C., Kema, G.H.J., and Ma, L.J. First report of Fusarium oxysporum f. sp. cubense Tropical Race 4 associated with Panama Disease of banana outside Southeast Asia. Plant Dis. 98: 694. The banana (Musa acuminata) genome and the evolution of monocotyledonous plants. Nature 488: 213-219. D’Hont, A., Denoeud, F., Aury, J-M., Baurens, F-C., Carreel, F., Garsmeur, O., Noel, B., Bocs, S., Droc, G., Rouard, M., Da Silva, C., Jabbari, K., Cardi, C., Poulain, J., Souquet, M., Labadie, K., Jourda, C., Lengellé, J., Rodier-Goud, M., Alberti, A., Bernard, M., Correa, M., Ayyampalayam, S., Mckain, M.R., Leebens-Mack, J., Burgess, D., Freeling, M., Mbéguié A Mbéguié, D., Chabannes, M., Wicker, T., Panaud, O., Barbosa, J., Hribova, E., Heslop-Harrison, P., Habas, R., Rivallan, R., Francois, P., Poiron, C., Kilian, A., Burthia, D., Jenny, C., Bakry, F., Brown, S., Guignon, V., Kema, G.H.J., Dita, M., Waalwijk, C., Joseph, S., Dievart, A., Jaillon, O., Leclercq, J., Argout, X., Lyons, E., Almeida, A., Jeridi, M., Dolezel, J., Roux, N., Risterucci, A-M., Weissenbach, J., Ruiz, M., Glaszmann, J-C., Quétier, F., Yahiaoui, N., and Wincker, P.
Ploetz R., Freeman S., Konkol J., Al-Abed A., Naser Z., Shalan K., Barakat R. and Israeli Y.
Combatting a global threat to a clonal crop: sequencing the banana black Sigatoka pathogen Pseudocercospora fijiensis (synonym Mycosphaerella fijiensis) reveals clues for disease control. PLoS Genet 12(8): e1005876. doi:10.1371/journal.pgen.1005876. Arango Isaza, R., Diaz-Trujillo, C., Dhillon, B., Aerts, A., Carlier, J., Crane, C.F., De Jong, T.V., De Vries, I., Dietrich, R., Farmer, A.D., Fortes Fereira, C., Garcia, S., Guzman, M., Lindquist, E.A., Mehrab, R., Quiros, O., Schmutz, J., Shapiro, H., Reynolds, E., Scalliet, G., Souza Jr., M., Stergiopoulos, I., Van der Lee, T.A.J., De Wit, P.J.G.M., Zapater, M.-F., Zwiers, L.-H., Grigoriev, I.V., Goodwin, S.B., and Kema, G.H.J. 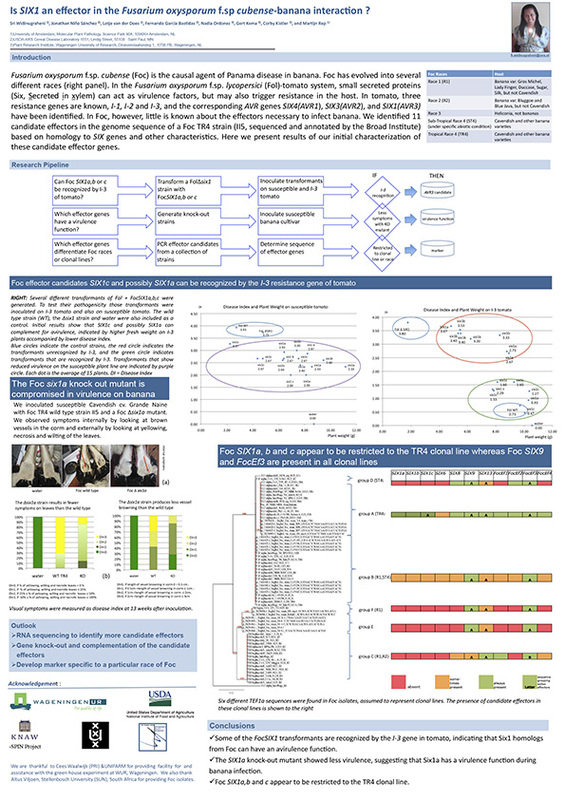 Defense Gene Expression Associated with responses during the Biotrophic Phase of Mycosphaerella fjiensis Morelet, Infection in Banana. Plant Disease 100:1170-1175. Rodríguez-Cabal, H.E., Rodríguez, E., Morales, J.G., Kema, G.H.J., Arango, R.E. Positive selection and intragenic recombination contribute to high allelic diversity in effector genes of Mycosphaerella fijiensis, causal agent of the black leaf streak disease of banana. Mol. Plant Pathol. 15: 447–460. Stergiopoulos, I., Cordovez da Cunha, V., Ökmen, B., Beenen, H.G., Kema, G.H.J., and De Wit, P.J.G.M. Resultados en línea de TR4 en germoplasma de banano. 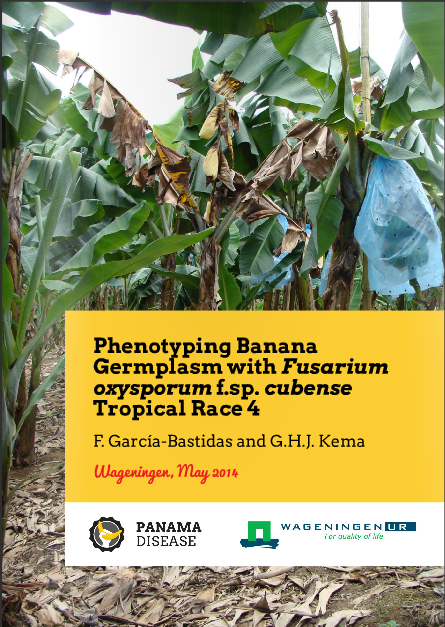 Phenotyping Banana Germplasm with Fusarium oxysporum f.sp cubense Tropical Race 4.